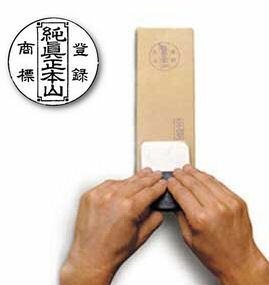 There are sharpening stones which had been set to a military secret in Samurai era. In Japan, There are sharpening stones which had been set to a military secret by administrators in Samurai era. Because sharpening stones improves their swords performance. That is to say, military strength is advanced. That’s the reason how come Samurai swords are strong and sharp. Let me tell you the history of this sharpening stones. 250 million years ago, sedimentary rocks moved to the one place (in what is now Kyoto) by Earth plate. Moreover, tectonic movements had made 20 mines for 100 million years.These mines are having Kyoto Natural Sharpening Stone. From B.C. 3rd century to A.D. 3rd century, ironware appeared. At the same time, sharpening stones is needed. Some of mines had been discovered. According to the oldest historically document, on 1190, Honma Touzayemon who was influential person at Umegahata in Kyoto presented sharpening stones to the Emperor Gotoba (the 82th Emperor). The Emperor spoke very highly of these stones. The Emperor Gotoba was famous Emperor who was both a good warrior and a good scholar. He sharpened his sword by himself. In those days, The Emperor Gotoba refused to appoint Minamoto-no- Yoritomo to Shogun. And the Emperor got Yoritomo to appoint Touzayemon to the head of Japanese sharpening stones instead. Touzayemon managed Nakayama mine. In 14th century, Nakayama mine became Imperial and Muromachi Shogunate sharpening stones mine. Because this mine have produced high quality sharpening stones than any other mines. After this period, through Ounin War, Sengoku period, some administrators ruled Nakayama mine. Since 1603, Tokugawa Ieyasu was appointed to Shogun, and Edo Shogunate had begun. Ieyasu appointed Hon-Ami family which had judged swords to manager of sharpening stones. And the mines had been set to a military secret and unmapped area. In 1868, Japan had modernized. Meiji period had begun. Meiji government announced officially the government ordinance of abolition of swords. Nowadays, we are using this sharpening stones for mainly a cooking tools for example Hocho (kitchen knife), ice picks and so on. These stones are popular among Japanese professional cooks. Because it is high quality sharpening stones.